The state of our hobby is strong. That's not the fashionable take these days -- not with books and TV segments focused on the sharp decline in things like card show attendance, revenue, and the overall number of people who've found a happy home among cardboard. But as someone who has rediscovered the joy of cards in the last few years following a too-long absence in my 20s, I can report that the hobby is stronger than ever. There's just one catch: You have to remember that it's a hobby for just about all of us. We know the woes -- the corner stores are going or gone, kids aren't getting hooked, and there's too much new product for even a die-hard collector to keep track of. And yet -- there's reason for hope. My journey of rediscovery began innocently enough -- at a flea market in California a few years ago. Before I continue, no, it did not involve one of those monster finds we all dream about, or even, really, a baseball card. It was a magnet. A local artisan had fashioned several of them out of miniature copies of 1956 Topps Baseball cards. Jackie Robinson caught my eye so I bought it for a few bucks. I studied that tiny piece of history -- a smiling Jackie on the left, dramatic slide into home on the right. I'd been a collector since I was young, but almost exclusively of modern cards. Here, though, was this marvelous piece of art, a half-century old, immortal No. 42, frozen in time. Actually, Jackie was frozen in a too-small magnet frame. So I went to eBay to check out the real thing. I bid, and I bid, and I bid. Eventually, I learned how to bid, and I won. My copy isn't in perfect condition, but it's still beautiful. 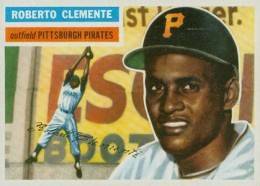 That led to more 1956 Topps purchases, online at first, then, tentatively, from the local stores I could find. Next came the shows. They weren't as frequent as I remembered them being, but still listed in Beckett, which, I learned, still published every month. I tracked down all the stars, then the non-stars, guys with funny names or different poses. I spent enough time studying them to form my educated guess that the 1956 portraits were drawn by someone who'd seen lots of pictures of baseball players playing, but probably never an actual game. Why else would Ted Williams be looking straight up, as if he'd hit a mile-high pop-up? What the heck was Harmon Killebrew doing fielding a ball on that side of the bag? I loved them despite the gaffes and goofs. Sometimes it was because of these quirks. Then came cards from other sets. 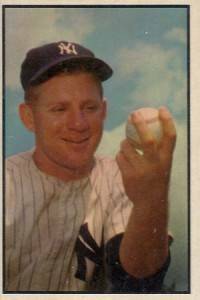 Soon I was dabbling in 1951 Bowman, 1967 Topps, 1934-36 Diamond Stars, a few T205s and T206s, and the most beautiful set of all-time (one man's estimation), 1953 Bowman Color. You’ll have to believe me when I say I didn't break the bank. It hasn't been cheap, but we're not talking PSA 8s here. Also, I'm not in a rush. Then, finally, I've moved back to the present -- the new Topps base issues, Gypsy Queen, Heritage. Yes, there are too many new cards. But you're not supposed to try to collect them all, so get over it. I recently had a conversation with my brother about the hobby we grew up in during the 1980s. It was an era where you could collect just about everything produced -- Topps, Fleer, Donruss, later Score and Upper Deck. We did our best to get it all. I pointed out that almost everything we bought then is worth less now than what we paid for it. "Yes," my brother said, "but we were lucky. We got to have fun." Rick Klein resides in Washington, D.C., and is Senior Washington Editor for ABC News. His collecting life stretches back through nearly 30 of his 35 years, and came of age at 109 Collectibles on Long Island, N.Y., and at shows at the Knights of Columbus in Babylon, N.Y. He is an eclectic collector, with particular interest in pre-war stars, 1950s baseball cards, Princeton alums, Walter Johnson, Hal Chase, anything Yankees, and anything and everything Dale Murphy. You can reach him on Twitter @rickklein. Nice article Rick. My only point of contention is the “too many sets now” phrase. You must not been collecting in the late 1990’s to the early mid 2000’s. Compare those times to now, the amount of cards produced and products released is a fraction of what it was, especially with only one company producing baseball cards. But I suppose if you compare it to say 1956, then I guess yes there are lots of products produced still. As the owner of http://www.stateofthehobby.com. I could not agree more.